Our whirlpool of a 24 hour news cycle creates a climate where 140 characters can destroy a career, build a name overnight or cause offense around the world. 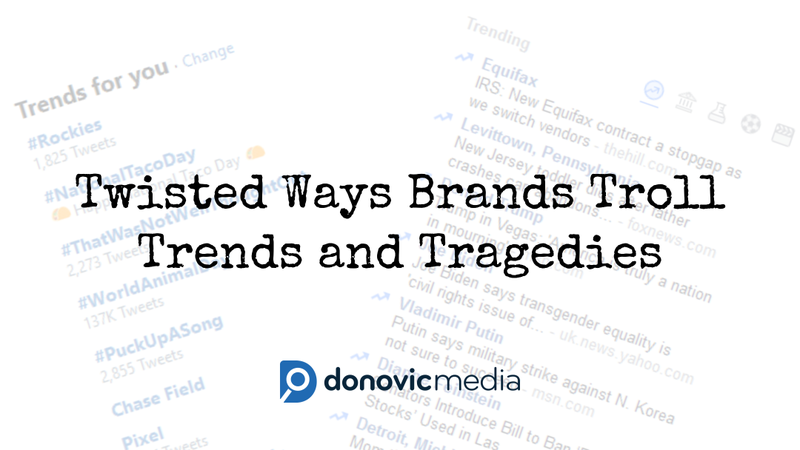 Brands and civilians alike are clamoring to latch onto the latest #trend, and unfortunately, even use tragedies transparently in order to boost their buzz. No matter how candid your brand voice may be, or how distinguished, even the best brands can take their eye off an intern and wake up to an avalanche of horrible press for a tactless tweet. Creating social media content is just that: social. And oftentimes it’s easy to focus on the “bottom line” of fandom, sales and awareness-building at any cost. Sometimes we forget that it is human interaction, interest and empathy, not blatant self promotion that propels the core of your content. In the wake of any tragedy, many brands that don’t have anything to do with the tragedy at hand, and stretch their connection appallingly far. The examples below might seem like obvious faux pas. They leave you scratching your head, wondering how exactly anyone ever green-lit the content… but sometimes when you’re up to your neck in due-dates, scrambling to reach for any #trending topic du jour, you can lose track of what’s appropriate. Unfortunately, these otherwise top-notch brands (or questionable brands, you decide) learned the hard way. Needless to say, the industry and fans did not sink their teeth into this supposed homage. 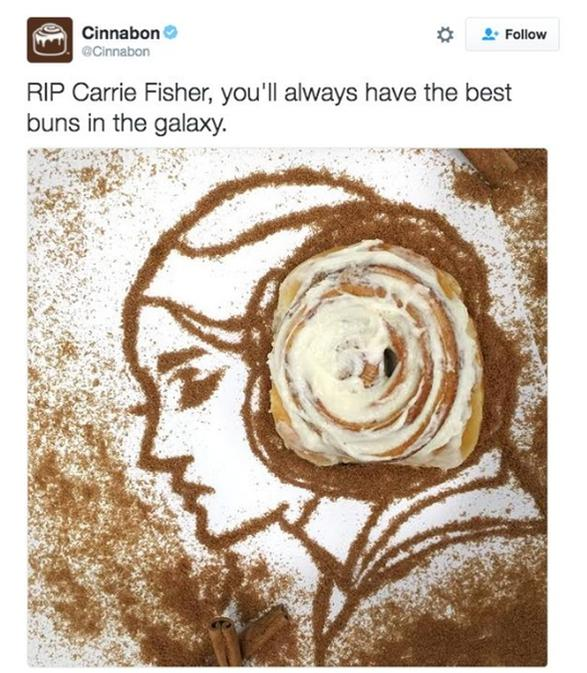 Aside from the implied Star Wars endorsement, the sticky-bun double entendre enraged many fans and mourners alike. While the image is creative, even well-intended, the disrespect is hard to see past. We’ve all seen the odd dejected employee take to their blog, Facebook, Twitter or other platforms to rant and rave about how “unfair” the world can be. 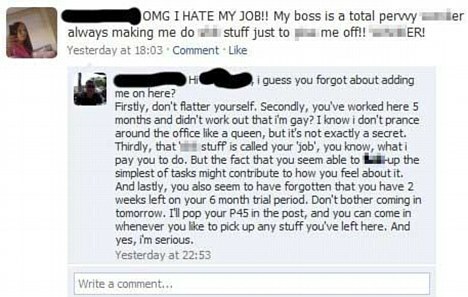 Sometimes, however undignified, it can be strangely satisfying to see someone called out, like in this example (which has nothing to do with marketing or branding, just a personal example of tactless complaint). The loss of livelihood and security for many is nothing to laugh about, nor is the alleged mismanagement of the departments that led to the troubling event. 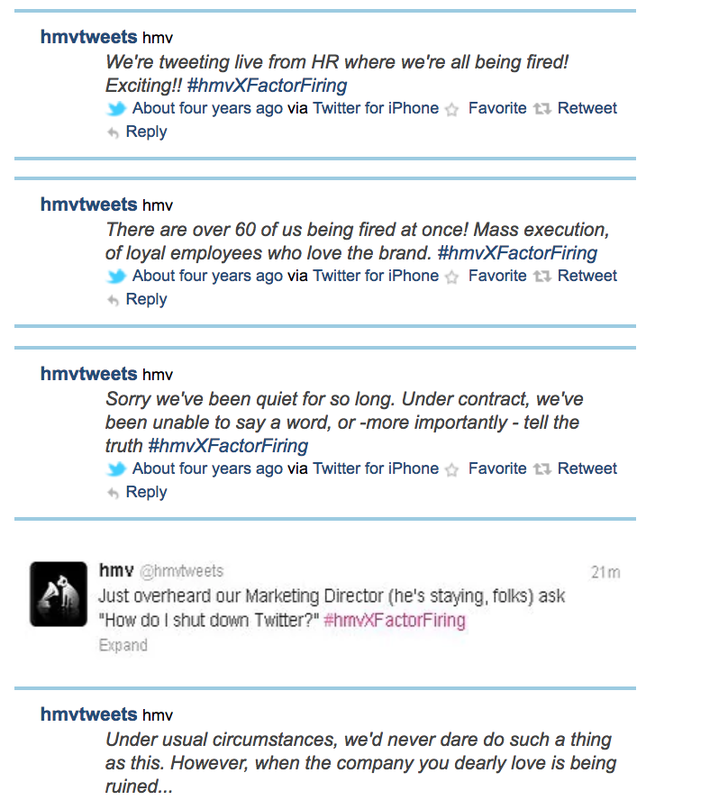 HMV still hasn’t recovered. Although the company had recently hired an outside agency to analyze redundancies, it was clear that some of the more valuable employees were let go, while some of the higher-ups had no idea how to handle the PR nightmare underway. From the bottom to the top, this #trending tragedy should be a cautionary tale to interns and executives alike. The importance of fluid communication, responsibility and departmental harmony can quickly make or break people’s lives and companies’ reputations. The trend of communication and caring will always be relevant. American Apparel, from the allegations of promoting what many deemed less-than wholesome images and interviews, to the controversial ousting of the founder, is no stranger to tiptoeing the line between “edgy” and “offensive”. However, their brand of offensive has crossed so far over the line sometimes that it isn’t simply fringe or niche groups they enrage. In one image they managed to cause incalculable damage to the brand, without any sensical relevance or discernable creative tie-in to their mission of “selling quality, American-made clothes.” Even though the offensive image attempted to create a “trending, sharable controversy” on purpose… but again, using death and destruction to create “buzz” without an empathetic backbone misses the simple ingredient of “humanity” we talked about before. 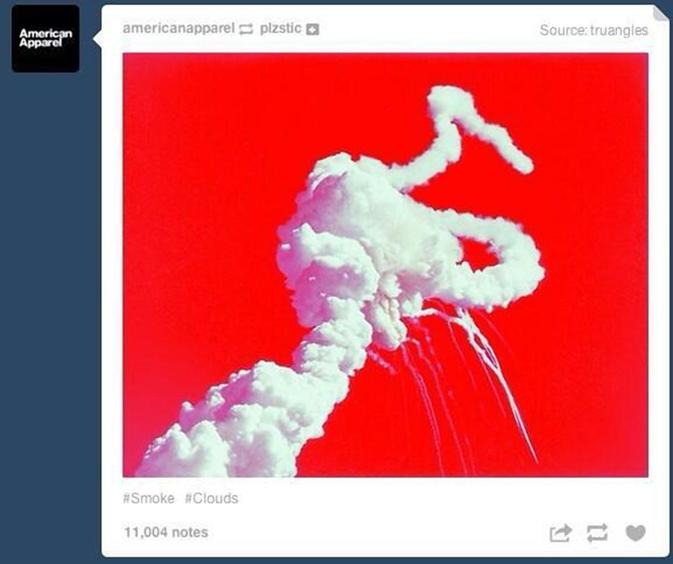 Even though this example is about two and a half years old, and it features the Challenger space shuttle explosion all the way back from 1986, the thoughtless shock-value of the brand’s careless approach to capitalizing on #trends backfired, causing outrage across the online world. Now, with untold pending lawsuits, a social media presence that seems more parasitic than groundbreaking, and a Canadian company buyout for pennies on the dollar, American Apparel refuses to see the tragedy it could become (despite making really comfy, well-fitting Ts). When Tragedy Does Trend, What is a Brand to Do? While social media is still widely misunderstood by many (all most of us have to do is look at our parent’s profiles to see the awkwardness in action), and it can be a brand-boosting opportunity to use relevant, trending topics to boost a social presence, tragedies shouldn’t be leveraged for brand-awareness. Unless your company is rallying to gather needed, relevant supplies (i.e. if you make branded tennis equipment, donating it to a hospital for an obvious PR boost may be a little transparent) , a related NGO, coordinating volunteers, or directly affected as a company; the best way to show support is to leave your brand name, product or promotions out of it and stick to the issue at hand. Think about the people affected, the pain of losing loved ones, and the lifetime of trauma and recovery that those affected could endure. Leave tweets and social tie-ins to light-hearted and relevant trends. For true, worldwide tragedies, the best “voice” is always authenticity, empathy and support. We’re all in this together, so put aside the urge to be a profit-mongering robot when real things are happening and real lives are being affected.